As US and Iranian diplomats decided not to meet together at Geneva Thursday and senators at home vowed to give nuclear talks one more month before introducing tougher sanctions against Iran, Foreign Policy's Yochi Dreazen and John Hudson worry that it all may be coming apart at the seams. "It's all raising fears that the historic nuclear deal which seemed so close just a few days ago might be slipping away," they say. Wendy Sherman, the chief American nuclear negotiator held a brief meeting Wednesday night with Iranian Foreign Minister Javad Zarif, but a senior State Department official said that Catherine Ashton, the European Union's top diplomat, was the only leader to hold direct and formal talks with the Iranians Thursday at the high-end Intercontinental Hotel here. The State Department official said leaders from the so-called P5+1 -- the U.S., Britain, Germany, France, Russia and China -- held bilateral talks throughout the day and stressed that Ashton was negotiating on behalf of the entire group. Despite the darkening atmosphere, it's too soon to conclude that the talks are unraveling. The current talks are designed to freeze -- or at least slow -- Iran's nuclear program for roughly six months while the two sides work towards a comprehensive agreement. The U.S. and its allies would give Tehran access to roughly $7 billion in frozen assets as part of any interim deal. Privately, two Western officials said Thursday's talks had been fairly productive and that there was still a decent chance of a deal. The officials said Iran might have been posturing to show their domestic audience back home that they were taking a hardline with the P5+1 rather than simply agreeing to every Western demand. Still, the lack of any direct contact between American and Iranian negotiations on the second day of what is supposed to be a three-day conference was striking. American officials say the talks can be extended through the weekend if a deal was close at hand, but the talks could also come to an abrupt halt Friday if the remaining differences between the two sides can't be bridged. Senate Majority Leader Harry Reid said on Thursday he was committed to moving ahead with a tougher Iran sanctions bill when the Senate returns from a holiday recess early next month, adding to pressure on negotiators meeting in Geneva on a deal to curb Iran's nuclear program. "I will support a bill that would broaden the scope of our current petroleum sanctions, place limitations on trade with strategic sectors of the Iranian economy that support its nuclear ambitions, as well as pursue those who divert goods to Iran," Reid said on the Senate floor. Addendum: it is still not confirmed that #SeKerry will go to #IranTalks in Geneva at all. A smiling Zarif goes for lunch leaving Cathy Ashton and P5+1 to chew over progress. 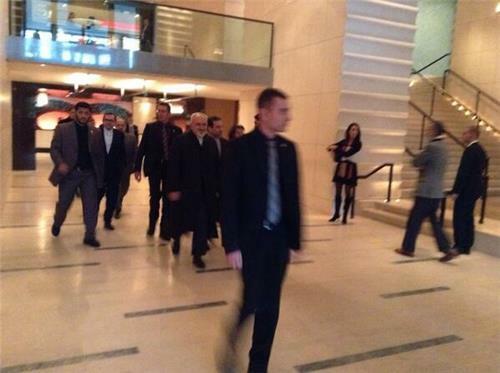 #Iran FM Zarif, walking out of the Intercontinental to a meeting, told Iranian journalists there is room for optimism. Iran FM Zarif before leaving hotel: "Three or four issues still remain as difference between us but one particular issue is the main one"
Iran FM Zarif before living hotel: "We have entered the phase of working on the text about the number of the differences that we had." 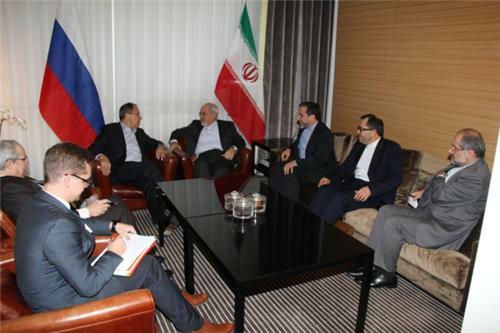 #Iran FM Zarif: talks have reached to serious phase. We have started editing some part of difference areas today. State dept: All delegations are in private consultations after Ashton-Zarif meeting. Folks are talking to capitals. Will reconvene this pm. Western diplomats say Secretary of State Kerry is likely to attend the Iran nuclear talks in Geneva, according to Reuters. However, Kerry may still choose not to, the news organization cautioned. As Russia's Lavrov enters the fray in Geneva, some reporters on the ground are speculating the Iran nuclear talks will continue into a fourth day. There has been no official word on whether talks will extend past Friday and Al Jazeera America is unable to confirm Aslani's and Irish's reports. 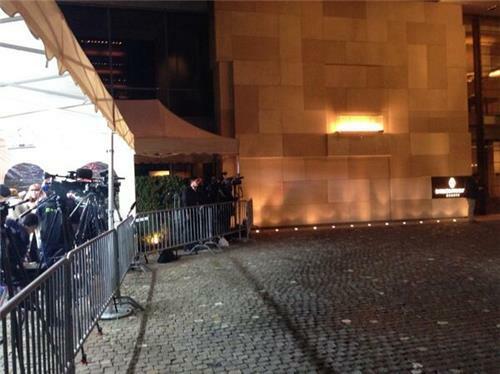 There has been quite a bit of talk this week about the intense security restrictions placed on reporters in Geneva. Swiss security guards took things a step further Friday when Russian Foreign Minister Lavrov arrived at the Intercon hotel, shushing reporters and telling them they weren't allowed to ask questions. Reuters' Louis Charbonneau called the last-minute restriction 'absurd' and applauded colleague Laura Rozen for defying the speech ban and calling out a question to Lavrov anyway: 'Three cheers to @lrozen for defying ban on questions for #Russia's Lavrov at Geneva Intercon! #Iran"
The White House said Friday it hopes an agreement with Iran can be reached in the Geneva talks, according to Reuters. The enrichment issue has been a heavy issue during the Geneva talks. Check out this detailed story from The Associated Press for an explainer on the enrichment issue. Psaki said this is the sixth round of P5+1 negotiations this year. Sec. Kerry has attended one. In The Guardian's latest dispatch from Geneva, they speculate a nuclear deal is closer than ever. 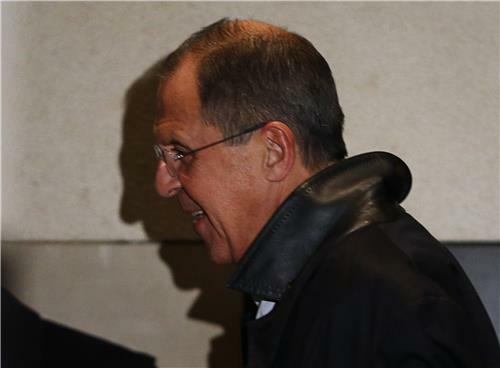 The Russian foreign minister, Sergei Lavrov, arrived in Geneva on Friday night to take part in negotiations on Iran's nuclear programme as diplomats said there were just a few outstanding issues preventing a breakthrough. Lavrov's spokeswoman said that Lavrov would meet the UN special envoy on Syria, Lakhdar Brahimi, while in Switzerland, though details of the meeting had yet to be arranged. The main reason for flying to Geneva, she said, was to take part in the Iran talks. Li Baodong, China's deputy foreign minister, also arrived on Friday at the talks venue, a central Geneva hotel. There were reports that the US secretary of state, John Kerry, would come for the conclusion of negotiations, but with the outcome in the balance late Friday, the state department could not confirm his movements. The flurry of raised expectations came on the third day of the third round of intense and detailed nuclear talks with Iran since the election of the reformist president, Hassan Rouhani, aimed at a deal that would defuse tensions in the Gulf and push back the threat of a new war in the Middle East. In light of progress being made, #SecKerry decided to travel to #Geneva to join ministerial colleagues tomorrow should agreement be reached. Fabius is on his way tonight, diplomatic source tells me. French Foreign Minister Laurent Fabius will travel to Geneva this evening to participate in the Iran nuclear talks, a diplomatic source tells Reuters. British Foreign Secretary William Hague confirmed on Twitter that he would join other foreign ministers in Geneva on Saturday. US Secretary of State Kerry decided to join the Iran nuclear talks in Geneva "in light of progress being made and in case an agreement may be reached", a State Department spokesperson tells Reuters. In light of the progress being made by Lady Ashton & the P5+1 team, Sec #Kerry decided to come to Geneva to join his ministerial colleagues. US Secretary of State John Kerry will fly to London from Geneva on Sunday to meet British and Libyan officials, the U.S. State Department said. Kerry arrived in Geneva on Saturday to join talks between six major powers and Iran about reining in the Iranian nuclear program in exchange for easing economic sanctions on Tehran. Foreign ministers from Britain, China, France, Germany, Russia and the United States attended the discussions. The United States and some of its allies suspect Iran of using its civil nuclear program as a cover to develop atomic weapons. Tehran denies this, saying its program is for purely peaceful purposes such as generating electricity. Kerry's planned departure for London, where he is to meet British Foreign Minister William Hague and Libyan Prime Minister Ali Zeidan on Sunday, suggests the Iran nuclear talks may wrap up by Sunday, though lower level officials could stay at them. An Iran nuclear deal within reach, U.S. Secretary of State John Kerry and five other foreign ministers focused Saturday on the fine print of a draft agreement meant to satisfy not only the other side, but also to placate powerful domestic forces that fear giving too much for too little in return. Diplomats refused to spell out details of the talks, held in a five-star Geneva hotel. But comments from both sides suggested negotiations focused on detailed wording that could be key in shaping an agreement that both sides could live with. Even though diplomats were said to be close to a deal after four days of talks, they also warned against expectations that a final agreement was imminent due to the complexity of the issues and the stakes for all sides.